Obama goes golfing AGAIN | can i just finish my waffle? ← Red Eye asks: Is it Obama? For four hours yesterday, our alleged president played golf with the vice president, as if to smear the nation’s face in the oil. But before he did that, he took a little time to blame the republicans for the condition of the country and to fly Air Force One to Ohio on Friday for a ten minute speech using at least $500,000 in fuel. Can you believe this man? I don’t think it would be out of line to remind him that HE is holding the highest office in the land and the democrats otherwise own Washington D. C.. In fact, the democrats had a majority in congress for two years before he took office. It seems almost silly to have to say that at this point in time with the Obama administration almost reaching the half-way point. And I ask you, honestly, have they done anything but drive us further down the wrong road? I don’t think anybody with an ounce of integrity could say that it hasn’t gotten worse and no relief in sight. That is the worst part. No relief in sight. But here’s the good news, the light at the end of this tunnel – the relief comes in November. At least the relief begins to happen. And will be finished off in 2012 when we elect a real president in this country, one that puts the country first. I would mention that the BP head also went sailing, but I notice that the left wing Obama sites have covered that in detail without once mentioned Mr. Obama’s GOLFING. And besides that, Mr. Hayward was not the one who took an oath to uphold the constitution and defend the county against all enemies both foreign and domestic. It was not a republican who was sworn in either. Obama is a democrat, right? Somebody said the oil is the enemy, and in a sense he was right. So that includes the oil, President Obama. The. worst. president. in. history. Nobody could be this blatantly nonchalant in the face of the worst ecological disaster in history, unless they intended to give America the middle finger. You know that as long as he is blaming the republicans he is admitting things are really bad. If they were going well, he would be taking credit. And when he focuses on jobs in Ohio to get attention off the oil disaster, that can’t be a good sign. There is a great article by Peggy Noonan in the WSJ “A Snakebit President” It’s spot on, and mentions that an absent George W Bush isn’t helpful to the present administration. Good for Peggy Noonan, but where was she when we really needed her?…she was one of those kissing Obama’s “boots”..oh, it was so very frustrating. As Tammy Bruce says, “Jimmy Carter must be breathing a sigh of relief. He is no longer considered the worst president in American history.” We’ve got a new “winner” now. Former Clinton Deputy Attorney General Jamie Gorelick – Back On The Pipe- Joins BP Legal Counsel. Jamie Gorelick best known for stove-pipping intelligence during the Clinton Years. Mel, hope your summer’s going good. Hi Mel!! good to see ya! 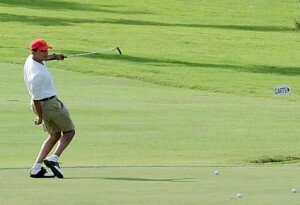 The question is: Will Obama be able to stay away from the golf course long enough to actually meet with McChrystal? I’m suspicous about something here. First of all, MSNBC was all over the McChrystal story this morning. So this was all planned, them picking out the points they wanted to emphasize. But are they driving the story for some reason or getting out in front of the story? The whole thing was so scripted. I guess it’s always scripted. Scarborough was disgusting and read his part to the letter. They were able to get an editor there to discuss the story (awakened from his sleep) Exclusive. Yeah, right. Why today? Why Rolling Stone magazine? How did this reporter get access to McChrystal, et cetera, for weeks. Was he undercover? Just asking. Or did they know he was there to write a story? Did they set McC up? This does get the focus off the Gulf oil spill. The only thing they had was the economy which was funny. Oil – bad, economy – bad. To Ohio to talk about jobs to get the focus off the oil gush, but jobless is at over 10 percent in Ohio. From the frying pan into the fire. But this looks bad too that Obama’s chosen is having a rift with him. Anyway, McChrystal was hand-picked by Obama. Maybe Bush was shooting in flares to give instructions and thereby the whole thing is his fault. Did they rush to the golf course to inform Obama about the article? Obama is furious. Ordered McChrystal to WH. Wall to wall coverage. Okay. Fire him. Then he can talk without restraint. I’m sure all the talk shows would clear their schedules. The ultimate question: Which one would you want to be in a foxhole with? Which one would be saying where’s my paci? Bella, my thoughts only.. but I think McChrystal knows what he is doing…don’t you think this is a very good way of more exposing of “the one.”…the weak little punk…..Oh, believe me, I’d much rather be in a foxhole with McChrystal. Obama — little whiny poo poo…letting an article in Rolling Stone magazine put him into an angry rant when a catastrophic oil spill in the gulf wouldn’t. Look, we all know is that Obama has total disrepect for the military.. the man is Commander In Chief, for God’s sake…and he DISRESPECTS the military. He needs to go ….I think most of us have had enough, including the libs if they would just “man up ” and admit it. McChrystal will probably get fired. He may want to be. How can you put your heart into serving a president who doesn’t give a rat’s a_s about what you are really doing except if it benefits him personally. Be strong, McChrystal, I’m with you at this point…tomorrow is another day, I guess. MSNBC’s role in this is very questionable. They never do anything unless to promote Obama agenda. I haven’t figured it out exactly yet, but they actually broke the story on Morning Joe and brought it into the mainstream even before it came out. This is turning out to be a somewhat blown out of proportion story in that most of the comments attributed to McChrystal were not made by him personally. But he made several mistakes…..
No. 1 he voted for Obama. No. 2 he allowed a Rolling Stone (ex-Newsweek) reporter in his midst (known anti establishment) so did he think anything good would come out of it. No. 3 Going out with him socially, drinking, and talking to a reporter with guard down. I would think such a setting would be off the record as a matter or courtesy if not protocol. No. 4 It was McCs fault for allowing the situation to develop. Jonathan Alter has been critical of McChrystal. Alter, who probably would be sucking on his pacifier if he could get it from Obama if he ever had to go to a war. Anybody Alter criticizes, I am compelled to defend. No. 5 This reporter wrote this in an article because he has an agenda. I would think he would have gone off the record when they were out drinking, but they should not have gone. N0. 6 NEVER TRUST A REPORTER. NEVER. These were not really public statements. They were made public by Rolling Stone and MSNBC. ( Meaning, McC didn’t call a news conference, you know.) Now, that just does not scream credibility to me. He should never have let the reporter in, that is his mistake, his bad mistake. Now we have this little wimp on MSNBC Jonathan Capehart expounding on it. Um, Um probably wouldn’t be able to get through boot camp. McChrystal was set up. Shame on him for allowing it to happen. He’s too smart for that. But maybe he wants out and just doesn’t care. Everything that was said is absolutely true. Pingback: Thank you, BP workers, thank you very much « Can I Just Finish My Waffle?